Bhubaneswar:The Odisha Hockey Men's World Cup Bhubaneswar 2018 got off to a thrilling start on Wednesday, with Belgium and home favourites India claiming opening day victories in Pool C in front of a sell-out crowd at the Kalinga Hockey Stadium. Belgium's Red Lions (FIH Hero World Ranking: 3) were outstanding in the first quarter of the World Cup opener, taking an early lead against Canada (WR:11) thanks to third minute goal from Felix Denayer before Thomas Briels had a goal ruled out by the video umpire. Red Lions captain Briels was not to be denied though, firing home a brilliant half volley mid-way through the second quarter, with Odisha Player of the Match Arthur Van Doren the supplier. While Belgium were dominant in the first two periods, Canada grew in stature as the game progressed and really hit form in the fourth quarter, enjoying a period of sustained pressure before Mark Pearson reduced the deficit when he forced home from close range. to a winning start.We started pretty well, especially knowing it was the first match of the World Cup so there were a few nerves, said Belgium goal-scorer Felix Denayer after the match. Leading 2-0 at half time, we really wanted to push through and get a few more goals but Canada did pretty well. We got a yellow card in the fourth quarter and Canada got the goal so we had to control the game, which we did well. We something like 16 shots on goal and six corners, so we will analyse that and see where we can get some more goals from, he said. Cheered on by the 15,000 fans packed into an electric Kalinga Hockey Stadium, India (WR:5) dominated the opening stages of their match against South Africa (WR:15), deservedly establishing a 2-0 advantage at the end of the first quarter thanks to wonderful, opportunist goals from Mandeep Singh and Akashdeep Singh. South Africa kept their opponents at bay in the second quarter, but India hit another double in the third period with Simranjeet Singh and Lalit Upadhyay putting the hosts into a commanding 4-0 lead. Odisha Player of the Match Simranjeet netted his second goal from a penalty corner in the fourth quarter to complete the scoring, giving the crowd one final opportunity to enjoy the fireworks show that greeted every goal scored on the opening day. Speaking after the match, India Head Coach Harendra Singh said: ?I am pleased that we got a clean match sheet, a 'zero' against India. That is a positive sign. My main defence is all eleven players, it is not [just] the defenders, [but also] the midfielders and the strikers. They knew what to do, and at the right time in the right positions they snatched the ball away, even in our circle. I'm very disappointed?, said South Africa captain Tim Drummond. ?We thought we could come here and get a result and put in a positive performance so naturally we are disappointed, but I know the strength of this group and we can grow and learn from these tough experiences. Away from the result, the match will live long in the memory for two players who reached significant milestones in the contest. 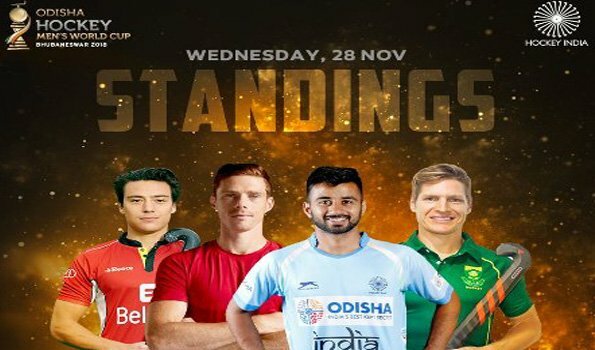 Chinglesana Kangujam made his 200th senior international appearance for India, with South Africa's Jethro Eustice reaching the 100 caps mark on the opening day of what is set to be a sensational two-and-a-half weeks of world class hockey.